On Tuesday the SPX made a new high at 1150 invalidating my favourite count I posted last weekend. But it also failed to break above 1150 for the third time. On Wednesday the market sold off back to 1130 again and one day later the breach of 1130 confirmed the beginning of a new downtrend as written on Tuesday. Till the end of the week the SPX lost another 40 points and closed near 1090. There are two short term counts: The first one, shown in the chart, calls for a green next week. 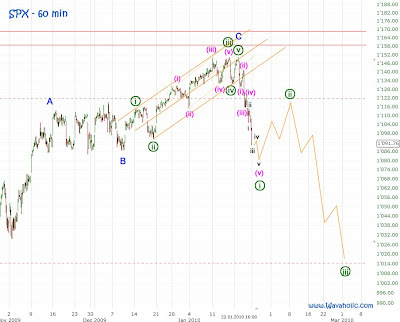 On Monday there may be another new low down to 1080ish to complete wave [i], but then wave [ii] should start and retrace about 50 to 62% of wave [i] - the 1110 to 1120 area should be a good target. In the second one (I'm gonna show it to you in my Nasdaq update) wave (iii) of [i] hasn't even finished. So there should be a lot more downside next week before wave [ii] will unfold. But I think that the first option is the more likely one. Gonna post some Dow, Nasdaq and Dollar charts later.